Letters from an American Farmer ; "Describing Certain Provincial Situations, Manners, and Customers, Not Generally Known; and Conveying Some Idea of the Late and Present Interior Circumstances of the British Colonies in North America. 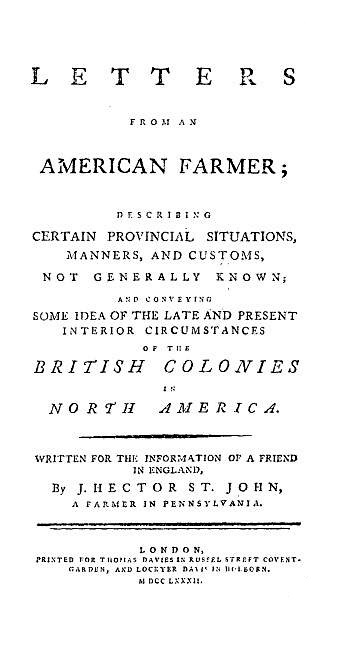 Written for the Information of a Friend in England" (1782) was a series of essays published by J. Hector St. John de Crevoecoeur, a self-described "Farmer in Pennsylvania." The work became the first literary success by an American author in Europe. Crevoecoeur was celebrated for his ability to describe to Europeans what made Americans distinct. The American dream, the American frontier, equal opportunity and self-determination were unique concepts this fledgling nation embraced. Its people's identity, culture and struggles with ethical issues like slavery were given voice in Crevoecoeur's collection of letters. As a knowledgeable insider and former "outsider looking in," Crevoecoeur's observations and writings about Americans were not dissimilar to the writings many years later by Alexis de Tocqueville, who applied his studies of political science and experiences traveling extensively throughout all America's states, to write Democracy in America (1835). It served as a "lessons learned" document to benefit France''s efforts to restructure its own government, and provided America with observations for ways we could improve upon our own. Part of our American History. Return to the J. Hector St. John de Crevoecoeur library.